The Gulf Centre for Human Rights (GCHR) and the Bahrain Center for Human Rights (BCHR) have expressed grave concern regarding the Bahraini authorities’ treatment of Nabeel Rajab, the imprisoned president of BCHR and the general secretary of GCHR, in addition to their refusal to grant him the early release he is eligible for as per the law. A request for early release was submitted by Nabeel Rajab’s lawyers on 21 January 2014 to the court but it was rejected and no reasons were given to back the decision up. Before announcing his verdict, the judge reportedly did not a take any action to investigate whether conditions for early release had been met. This is the third attempt submitted by Rajab’s lawyers requesting his release, based on article 349 of the Code of Criminal Procedures which sets conditions for early release. – The defendant does not pose a threat to public security. Although all three of those conditions apply to Rajab’s case, all requests submitted by his lawyers were rejected without reason. It’s saddening to be away from your important meeting for the second time and, as you know, this absence is out of my control. I was banned from travelling during the previous IFEX general meeting in 2011 without any given reason. My absence this time is because I have been behind bars for more than a year as I am serving an unfair and arbitrary sentence as revenge for my struggle and activities which aim to defend freedom of opinion and freedom of expression in my country Bahrain and in the whole of the Gulf region. I would like to inform you, my dear friends, that despite the bad and difficult circumstances I have been suffering from since my arrest, my beliefs have not changed at all and my spirit is still very strong. These circumstances have not weakened me or caused any despair or lack of hope. This injustice has motivated me to continue fighting for freedom of opinion and expression and for human rights, and to stand by all oppressed peoples whose rights have been violated, and to enable them to look forward to a better future. Dear colleagues, the dissemination and promotion and protection of human rights principles and moral values and virtues in our communities which live under oppression and injustice is not an easy job, but we must, as activists and human rights defenders in this region of the world, be prepared to pay the price of this struggle, and this price is often painful and it is the punishment I serve out today, which has kept me away from you and from this valuable meeting. What makes me strong, brave and respectful is the stance and support given by you and the free people of the world to me and to all people who are detained because of their opinions and human rights work in the Gulf region. It is because of the good feelings you have given us, which made clear that we as Bahraini and Gulf activists are not alone in the battle for gaining freedom. You are standing by us. The continuous urgent actions and the incredible work you have done through IFEX in recent months was brilliant and clear to all in our country and the whole region and also to regional and international human rights institutions. The fast professional development of the network (IFEX) would not have happened without these unknown soldiers who work tirelessly at IFEX’s offices day and night. These people became like members of my family who communicate on a daily basis and the youngest of my children now knows the names of the staff and managers of IFEX as a result of this constant communication and the care that is shown. Certainly our network has a global position today, developing in a few years as one of the leaders of the major struggles in defending human rights and freedom of opinion and expression in the world. And so we feel proud when we tell people that we are members of IFEX which takes up the fight and has contributed to spreading human rights education and the awareness of freedom of opinion and expression in our Gulf region and also publicising and uncovering the ongoing violations against freedom of expression worldwide in different languages. Also, the network has offered professional, technical, moral and organisational support available to us at the Bahrain Centre for Human Rights and the Gulf Centre for Human Rights and also for many regional and international organisations which work on similar issues. I call on you to carry on with your work for a better future for our rights of freedom of opinion and expression and all human rights worldwide and especially in our region, towards which most countries turn a blind eye in order to protect their interests in the oil-rich region. Finally, I must lift my hat and bow my head in respect and appreciation for your struggle for rights and send a kiss and hug for each one of you. The imprisoned President of the Bahrain Center for Human Rights, Nabeel Rajab, on Wednesday called on the Bahraini people to rely on their own and expand and increase popular protests against the Al Khalifa regime, reiterating that pinning hope on the international community would be wrong. “Sitting at homes and pining hope on international organizations to rescue us is a mistake, do not pin your hope on a mirage and rely on the presence of yourselves on the scene and in the squares,” Rajab said. He further described as “worthless”, the Bahraini regime’s decision to ban protests, reiterating that all the political spectrums should challenge the decision and take to the streets. Hundreds of Bahrainis staged large demonstrations across the country on Sunday, calling for the ouster of the al-Khalifa regime and the establishment of a democratic ruling system in their tiny Persian Gulf island. The protesters asked for the downfall of the Bahraini regime, establishment of a democratic system, and voiced support for people in Mahza village, southern capital City of Manama, which has been under siege by the Bahraini security forces since two weeks ago. According to the Bahraini media, the security forces have launched several night raids on the village residents. The Bahraini government, facing protracted unrest by an overwhelming majority of the people, has resorted to any harsh measure to suppress popular protests and arrest political activists. It also revoked the nationality of 31 men on charges of harming national security earlier this month. The men include London-based dissidents Saeed al-Shehabi and Ali Mushaima, the son of jailed opposition leader Hassan Mushaima, as well as clerics, human rights lawyers and activists. Also on the list published by Bahraini News Agency (BNA) were two former parliamentarians from the leading Shiite party Wefaq, Jawad and Jalal Fairooz. Paris-Geneva, November 8, 2012. The Observatory for the Protection of Human Rights Defenders, a joint programme of the International Federation for Human Rights (FIDH) and the World Organisation Against Torture (OMCT), deplores the Bahrain Appeals Court’s refusal to refer a petition for preliminary ruling on the legality of the law prohibiting demonstrations in Bahrain and to release Nabeel Rajab, who has been arbitrarily detained since July 9, 2012. On November 8, 2012, the Bahrain Appeals Court resumed the hearing on the appeal against the three years’ imprisonment sentence pronounced against Mr. Nabeel Rajab, President of the Bahrain Centre for Human Rights (BCHR), Director of the Gulf Centre for Human Rights (GCHR) and FIDH Deputy Secretary General , on August 16, 2012 by the Lower Criminal Court for three cases related to his participation in peaceful gatherings in favour of fundamental freedoms and democracy. The hearing was attended by Mr. Antoine Aussedat, French lawyer, who was mandated by the Observatory to conduct an international trial observation mission. He was the only observer mandated by an international NGO. Several diplomats representing France and the USA also attended the hearing. During the hearing, a new request for Nabeel Rajab’s provisional release was rejected by the Court. Then eight videos were shown: five videos filed by the Prosecutor displaying images shot by the police on the demonstration in relation to which Nabeel Rajab had been arrested and three videos filed by the defence lawyers containing speeches or interviews attesting that Nabeel Rajab advocated for non violence, a video of a demonstration during which Nabeel Rajab was charged and hurt by the police and extracts from a pro-government TV broadcast in which Nabeel Rajad was depicted as a dangerous agitator and manipulator. The content of the videos was discussed by the court and the defence lawyers. Finally the court denied a petition filed by his lawyers to refer to the Supreme Court a question for a preliminary ruling on the constitutionality and legality of the law banning demonstrations in Bahrain, with regard to international conventions and announced that the verdict would be made public on December 11, 2012. Paris-Geneva, October 18, 2012. The Observatory for the Protection of Human Rights Defenders, a joint programme of the International Federation for Human Rights (FIDH) and the World Organisation Against Torture (OMCT), deplores the violation of the rights of the defence during the third hearing of the appeal against the three years ’ imprisonment sentence pronounced against Nabeel Rajab, who has been arbitrarily detained since July 9, 2012. On October 16, 2012, the Bahrain Appeals Court resumed the hearing on the appeal against the three years’ imprisonment sentence pronounced against Mr. Nabeel Rajab , President of the Bahrain Centre for Human Rights (BCHR), Director of the Gulf Centre for Human Rights (GCHR) and FIDH Deputy Secretary General, on August 16, 2012 by the Lower Criminal Court for three cases related to his participation in peaceful gatherings in favour of fundamental freedoms and democracy. The hearing was attended by Mr. Antoine Aussedat, French lawyer, who had been mandated by the Observatory to conduct an international trial observation mission. He was the only trial observer mandated by an international NGO. Several diplomats representing France, Germany, the United Kingdom and the USA also attended the hearing. The Observatory deplores that at least one international defence witness was denied entry to Bahrain. Indeed, FIDH’s Representative, Stéphanie David, Head of MENA Desk, who had been called upon to testify as a witness by the defence team, was denied entry into Bahrain on October 16, 2012. The Observatory considers that preventing international experts from testifying before a court amounts to a blatant violation of the rights of the defence. Nabeel Rajab’s lawyers had formally requested the Court to issue a letter to the Customs to facilitate the entry of several international witnesses, including Ms. David, but the court refused to issue such a letter. Despite the Court’s lack of support, FIDH, together with the defence lawyers, decided to confirm Ms. David’s travel to Bahrain for the purpose of the trial. During the hearing, the defence lawyers’ request to call international witnesses was rejected by the Court on the ground that their testimonies were not “relevant”. Paris-Geneva, October 2, 2012 – The Observatory for the Protection of Human Rights Defenders, a joint programme of the International Federation for Human Rights (FIDH) and the World Organisation Against Torture (OMCT), deplores the decision to further delay the trial on appeal of Mr. Nabeel Rajab, President of the Bahrain Centre for Human Rights (BCHR), Director of the Gulf Centre for Human Rights (GCHR) and FIDH Deputy Secretary General. Such ongoing judicial harassment and arbitrary detention is one more evidence of the continued criminalisation of human rights defenders’ activities. On September 27, 2012, the Bahrain Appeals Court once more refused to release Mr. Nabeel Rajab on bail and further postponed the ruling on his appeal to October 16, 2012. The Bahrain Appeals Court was seized by Mr. Rajab’s lawyers to contest the decision taken on August 16, 2012 by the Lower Criminal Court to sentence him to three years’ imprisonment for three cases related to his participation in peaceful gatherings in favour of fundamental freedoms and democracy. In addition, during the hearing, the court continued to deal with the three cases as separate cases, rejecting once more the request of the defence to merge them. Mr. Rajab has been detained since last July 9 and has been continuously denied release since then. Moreover, during the hearing, the judge reportedly showed a DVD containing images of Mr. Nabeel Rajab at peaceful demonstrations arguing with an officer on the legality of the protest, as well as images of young people throwing Molotov cocktails during what the judge alleged was one of these protests. Mr. Rajab’s lawyers insisted that this last part did not take place at the same location nor time as those of the said peaceful protest. Mr. Rajab further recalled that none of the protests he attended had witnessed violence. Mr. Rajab’s lawyers s well as some observers who attended the hearing, consider that this part of the DVD consist in clear montages. The Observatory is thus extremely concerned over the new postponement decided by the judge, as it aims at sanctioning Mr. Rajab’s human rights activities by keeping him in arbitrary detention. The Observatory further strongly denounces the montages broadcast in court, which clearly aim at discrediting Mr. Rajab and legitimate peaceful protests in general. In addition, the Observatory deplores that, notwithstanding the commitments expressed on several occasion by the Bahraini authorities to make NGOs’ access to Bahrain easier, the visa request which was submitted by the Observatory on September 19, 2012 to the relevant authorities on behalf of an Observatory-mandated trial observer, was accepted only a few hours before the planned flight departure of the said observer, making it impossible for him to travel to Bahrain. The Observatory further highlights that on September 26, Ms. Zainab Al-Khawaja, a human rights blogger who has been denouncing human rights violations of the Bahraini regime, was sentenced to two months’ imprisonment on the charge of destroying government property for publicly tearing a picture of the King of Bahrain. The Observatory recalls that Ms. Al-Khawaja has been detained for almost two months, and has therefore already served most of the sentence. It is however unsure whether she will be released in the following days or be kept in detention, as 12 other cases have been filed against her over the past months for her participation in peaceful protests. Just weeks ago, Nabeel Rajab, the “Gandhi of Bahrain,” spent his birthday in a prison cell. Originally “jailed for a tweet,” Rajab, the renowned president of the Bahrain Center for Human Rights, now faces up to three years in prison for allegedly inciting violence among protesters against the Bahraini monarchy. Bahrain has been engulfed in turmoil since early 2011 when the US-backed Al-Khalifa regime launched a violent crackdown against the nation’s popular non-violent reform movement. The regime has since selectively targeted the island’s ethnic-majority, its Shia population, and has gained a terrifying reputation for using brutal torture tactics on those citizens detained. Recently, Bahrain’s appeal courts upheld the sentence of 20 other opposition activists, ignoring domestic and international outcry. In the Spring of 2011, I met Rajab and his family in their home in Bahrain. His then nine-year-old daughter, Malak, joined us for the interview. Just hours before our arrival, masked state security forces raided the Rajab’s family compound in the middle of the night, bombarding the grounds with teargas and forcing their way into the Rajab’s home with heavy weaponry. Needless to say, little Malak was far too traumatized to attend school that day. These condemnations from the State Department, however, are not reflected in U.S. policy toward the Bahraini monarchy. Despite the well-documented violence against its citizens, the U.S. Department of Defense resumed arms sales to Bahrain, rekindling a relationship that sold $200 million worth of weaponry to the regime in 2010. American companies added further insult to injury by hosting international oil and natural gas conferences and the 2012 Formula 1 Bahrain Grand Prix, amidst the curfews and kidnappings that characterized daily life for the majority of Bahraini citizens. This gaping distance between America’s actions and words continues to send a far louder message to Bahraini civilians than the lip-service of the U.S. Department of State. WASHINGTON – For a second time since he received the Ion Ratiu Democracy Award last year at the Wilson Center, human rights activist Nabeel Rajab has been detained by the Government of Bahrain. “On behalf of the Wilson Center, I urge Mr. Rajab’s prompt release,” said former Congresswoman Jane Harman, current director, president and CEO. “The Government of Bahrain would be wiser to tolerate dissent and promote the free expression of views. Events in the region in the past year make clear that local voices will not remain silent and repression will be resisted,” she added. The Ion Ratiu Democracy Award aims to bring international recognition to the ideas and accomplishments of individuals around the world who are working on behalf of democracy. Whether in exile from repressive regimes or operating within emerging democracies, recipients of the Ion Ratiu Democracy Award are democracy advocates with the type of life-changing experience in Washington that Ion Ratiu encountered as a young Romanian democracy activist in the 1970s and 1980s. The Award provides a month-long scholarship at the Wilson Center during which awardees have an opportunity to immerse themselves in the scholarly, policymaking, and NGO communities in Washington, D.C. Recipients also provide the keynote address at an international symposium on major issues confronting their democratic activism. Nabeel Rajab received the award in a ceremony at the Wilson Center in Washington D.C. in December 2011. When Rajab was badly beaten during a rally in the Bahraini capital of Manama in January 2012, Jane Harman joined the State Department in expressing concern direct to the Bahraini Ambassador to the United States and called for a full investigation into the incident. (CNN) — For more than a year, Bahrain has been the site of anti-government protests. What does the government say about the demonstrations and rights groups’ accusations of a crackdown? CNN: A Bahrain court sentenced activist Nabeel Rajab to three years in prison, a government spokesman said Thursday, and this week, the Court of Appeals acquitted him of defamation. Amnesty International has said the sentence questions the independence of the judiciary. How do you respond? AlBinali: Nabeel Rajab had a number of cases against him. The one you mentioned, the defamation case, the Court of Appeals cleared Nabeel Rajab of that charge. However, he is in prison for other cases, for active incitements and indirect participation in illegal demonstrations and rallies, and through the use of petrol bombs and improvised weapons. There have also been numerous cases of assault against police officers. The minister of state for media affairs gave a press conference a few days ago detailing the decision in that case of inciting illegal rallies and marches in very busy areas and in the commercial district of the capital. CNN: Najeeb Rajab is still in prison, correct? CNN: And there’s another sentence for which he’s in prison? AlBinali: No. The minister of information — the minister of state media affairs — she pointed out that there were three specific incidents that took place earlier this year: the first on January 12, the second on February 14, and the third incident was on March 31. This is a form of behavior that has been engaged in regardless of numerous warnings and cautions regarding the illegal state of crowd incitement and detrimental effect it has on safety and public order. As if local history is the only force dictating U.S. policy on and around the island. King Hamad has certainly played some parts of his counterrevolutionary hand with skill. While his modest security forces are not equipped to cause the same destruction as Muammar Gaddafi or Bashar al-Assad’s armies, Hamad and his royal circle could employ a variety of lethal tactics to break the opposition’s will to resist. Instead they have chosen pellet guns [shotguns] and U.S.-made tear gas canisters over automatic weapons as their primary instruments. Beatings, night arrests and other non-lethal tactics also keep the island’s casualties, international pressure and media exposure to a minimum. Applying lessons from Western crowd control tactics – including the so-called Free Speech Zones abused by the Bush administration – Hamad’s government even contracted Western police figures John Timoney and John Yates to add to his performance’s realism. Posner would claim that Bahrain’s violence has “reduced significantly” in recent months, but nothing could be further from the truth. That Bahrain’s violence sits at the opposite end of Syria’s spectrum is true, except relativity doesn’t negate the repressive environment that its opposition labors under. 2012’s casualties and injuries have maintained a similar pace as 2011, pushing the death count closer to 100, and police abuse remains a frequent occurrence. The island is only becoming more divided over time. Nabeel Rajab, Abdulhadi Al-Khawaja, his daughter Zainab and other peaceful figures of the opposition remain incarcerated for political reasons, antagonizing Bahrain’s democratic movement and foreign supporters. Meanwhile a U.S.-backed dialogue with Al Wefaq and its allies drifts lifeless down a river of mistrust, and this collective marginalization is venting into the streets. Now the harsh sentencing of Rajab threatens to top all of the King’s blunders and add more drag on U.S. policy. Rajab and his family counted themselves among the few who weren’t surprised by last Thursday’s verdict, because even hardened observers of Bahrain’s uprising shook their heads in disbelief. Ego and fear offer a plausible explanation for the monarchy’s counterproductive behavior. Leaving aside the injustice of his three-year sentence, one each for three different charges of instigating protests and violence, imprisoning Rajab will not accomplish the government’s objective of restoring order. Hero-making makes for flawed counterrevolution and is thus perplexing at the strategic level: three years in prison equates to at least three more years of protests. Jail walls won’t stop his Twitter account or his followers from marching in his place. MANAMA, Bahrain — A prominent Bahraini human rights activist was found guilty Thursday of instigating and participating in several illegal gatherings and sentenced to three years in jail. The unexpectedly stiff sentence against Nabeel Rajab will raise questions about the Western-backed Sunni monarchy’s commitment to reform, and embolden anti-government protesters who have been demonstrating the past 18 months for greater rights in the Gulf island kingdom, home to the U.S. Navy’s 5th fleet. Rajab, who is already serving a three-month sentence for posting anti-government comments on Twitter, was in court for the verdict. He is president of the Bahrain Center for Human Rights. Rajab’s attorney Mohammed al-Jishi said each of three cases yielded a year imprisonment, for a total of three years. Al-Jishi said he plans to appeal the ruling. In a separate case involving comments made on social media site Twitter, a judge delayed issuing a verdict against Rajab’s appeal until Aug. 23. Bahrain has experienced near daily protests since February 2011 following an uprising by the kingdom’s Shiite majority seeking greater political rights from the Western-backed Sunni monarchy. At least 50 people have died in the unrest and hundreds have been detained, including prominent rights activists and Shiite opposition leaders. Shiites account for about 70 percent of Bahrain’s population of just over half a million people, but claim they face widespread discrimination and lack opportunities granted to the Sunni minority. The country’s leaders have offered some reforms including restoring jobs for many Shiites pushed out from their posts at the start of the uprising and giving parliament more power. But the opposition says they fall short of Shiite demands for a greater voice in the country’s affairs and an elected government. The unrest has put Washington into an awkward position. U.S. officials have called for efforts to reopen political dialogue in Bahrain, but are careful not to press too hard against the nation’s leadership and possibly jeopardize its important military ties. Rights groups criticized the ruling against Rajab and said it raises questions over whether the regime is serious about reforms. They have called for his immediate release. Track Record of postponements raises question of political show trials. On Thursday August 16, a court in Manama, Bahrain is expected to issue a verdict/hear briefs in four cases pending against Human Rights Defender Nabeel Rajab, including Rajab’s appeal over the three-month sentence he is currently serving for being found guilty of libel due to posting six statements on Twitter that are critical of the Bahraini Prime Minister. The other cases that the court will hear include allegedly inciting gatherings and unauthorized marches. 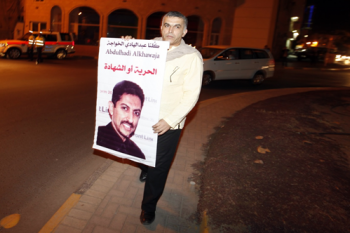 This is not the first time the court has set a date for a verdict, and in other prominent cases – notably that of Abdulhadi Al-Khawaja – the court has met only to announce a delay. These postponements raise the question as to the legitimacy of Bahrain’s judicial process. Media reports have cited the delays as an indication of the government’s commitment to reform, yet the track record to justify such conclusions is lacking. The appeals verdict for prominent Bahraini human rights leader Nabeel Rajab, imprisoned after sending a tweet calling for the kingdom’s prime minister to resign, will be issued Thursday according to Rajab’s lawyer. The decision had been scheduled to be announced Sunday for Rajab’s twitter comments as well as three other charges relating to illegal assemblies. Nineteen U.S. lawmakers had written a letter prior to the original Sunday appeals date calling for Rajab’s release, as did the rights leader’s family calling for the international community to put pressure on the Bahraini government. On 5th August, a Bahrain court will hear an appeal by the activist Nabeel Rajab, president of the Bahrain Centre for Human Rights, against the conviction and three-month jail sentence imposed on him last month for posting messages on Twitter that were alleged to be libellous. At the same hearing, the court will consider another case against him for participating in illegal demonstrations, originally due to be heard on 26 September. Pending the appeal verdict in a few days’ time, Reporters Without Borders deplores the authorities’ harassment of Rajab and expresses concern about the position of human rights campaigners in Bahrain. “We urge the Bahraini justice authorities to drop the charges against Nabeel Rajab and call for his immediate release,” the press freedom organization said. It condemned the crackdown on dissident voices and called on the international community to step up the pressure on the kingdom. Rajab was found guilty of libelling the citizens of the town of Muharraq. In his tweets he accused the prime minister – who was visiting the town — of corruption and called on him to resign, saying the people had welcomed him only because they had been offered subsidies. Beirut, 04 August 2012- The Gulf Centre for Human Rights (GCHR) and the Bahrain Centre for Human Rights (BCHR), call on the authorities in Bahrain to immediately release Nabeel Rajab, President of the BCHR and director of the GCHR and to drop all charges against him. On 5 August 2012, the Higher Appeal Court will rule on the appeal submitted by Nabeel Rajab’s lawyers against a three-month prison sentence, which was handed down on 9 July by the 5th Lower Criminal Court. The human rights defender was found guilty of libel based on posts on his Twitter account directed at the Prime Minster of Bahrain where he highlighted his corruption and called on him to step down. (For more information see GCHR appeal dated 7 July 2012 http://gc4hr.org/news/view/190). Nabeel Rajab’s lawyers filed two appeals the first one, requesting that the three months prison sentence be commuted into community work, was rejected by the Court. The second appeal was a request to have the sentence suspended. This is the third occasion that this appeal will be before the court. The matter had been scheduled to be heard on 18 July 2012 however the court adjourned the hearing until 24 July so that it could examine the case file. 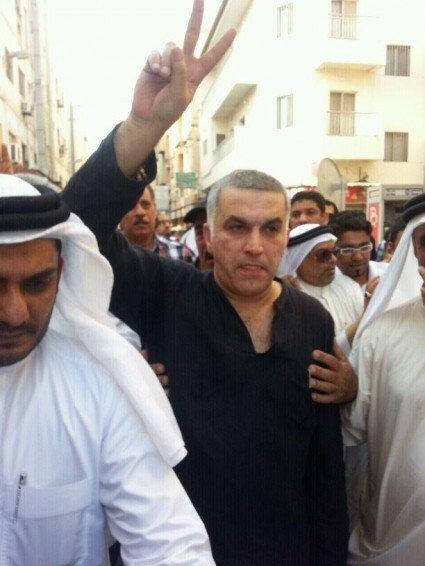 On 24 July 2012, Nabeel Rajab appeared before the court for the second time. On that occasion, the Court refused to release the human rights defender on bail and stated that it would issue its verdict on the appeal on 5 August 2012. MANAMA, Bahrain — A prominent rights activist jailed in Bahrain says his detention is a political act aimed at weakening the uprising against the Gulf kingdom’s rulers. Nabel Rajab also told a judge on Wednesday that authorities seek to muzzle free expression as part of crackdowns against opposition groups. Rajab, the president of the Bahrain Center for Human Rights, was arrested May 5 and charged with using social media to insult Bahraini authorities and encourage demonstrations. Fifty-five lawyers attended his hearing in a show of solidarity with Rajab. (Beirut) – Bahraini authorities should drop politically motivated criminal charges against Nabeel Rajab, a human rights activist, and release him immediately. Rajab is scheduled to go on trial on May 16, 2012, for “offending an official institution” – namely, the Interior Ministry, which he criticized for allegedly ignoring attacks against boys and young protesters as well as Shia-owned businesses.